At least once a week we'll be asked 'Why does my site not show up in Google?' so we thought we'd go through some of the basics of how to leverage Fabrik to help you get better results. So first things first the broad term for this is SEO (Search Engine Optimisation). It might feel like Google is the only search engine on the internet, but it isn’t - believe it or not there are others! Bing and Yahoo just to name some for the fun of it. With everything you do for SEO you have to bear in mind what search terms you'd like to rank for. An example - if it was ‘London based commercials director’ these words would have to be in the site a few times, otherwise the search engine has no idea if your site is a relevant target. If you can structure them together in a sentence like this that is even better. If this is your first website on your domain you can skip this but if you already have a website and a good SEO rank, to make sure you keep that rank you should add in redirects, have a look at this tutorial on adding redirects if anything is unclear just ask us. Fabrik is built from the ground up with SEO in mind but only if you add all the information. So I always think about SEO from the angle if you didn’t know what the images or videos on your page were how would you know what that page is about? 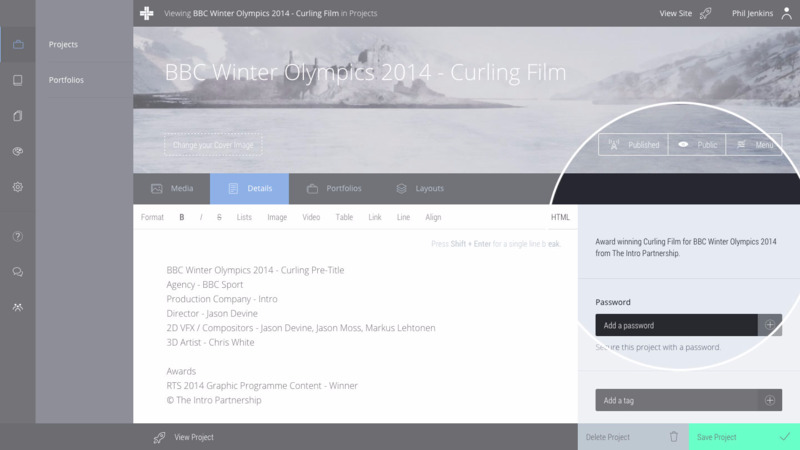 Inside every project in Fabrik you have a details tab for your project description. Also you have a summary box located near the top. These are your most powerful tools when it comes to SEO. The summary box will be your projects meta description. You know when you Google something and you get a couple of lines of text? That's the meta description of that webpage. The meta description is the go-to place for contextualising that page. 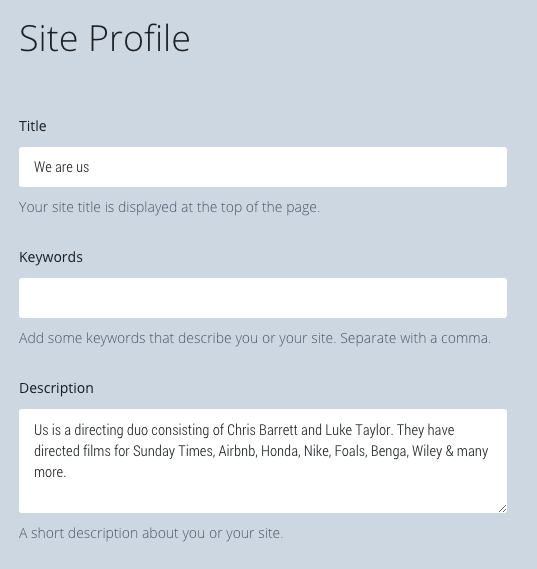 So add an informative description of that page into the summary with keywords you would like to be indexed on. Keep in mind if Google finds other text on your page more relevant to the search it can change your description. Alongside the summary if you can have a description of the project that's a bonus. The more content the search engines have to crawl the better your chances. So we've covered the basics for a project, what about your home page or a portfolio. Portfolios work exactly the same as a project, as do pages and blog posts - so nothing new there. For your homepage you will have to use the site description in your Settings > Site Profile section, again this will serve as the meta description but also if you don't add any summary for any projects, portfolios, blog posts, etc it will show there, so we have you covered if you forget. Alongside meta data is the URL, slightly underrated but contextual URLs can score some points with search engines. There are 2 parts we are interested in, the hostname (www.yourdomain.com) and the path (the rest of the URL after the hostname). If you wanted to get to the top of Google for your name, you will always stand a better chance if your hostname is your name. Remember in Fabrik you can have as many hostnames as you like pointing you to your site so you can always own the .com and .co.uk etc. Onto the paths, when you create anything in Fabrik whether it be a project or blog post we will automatically create the unique path for you. For example if you have a project with a title of 'Labrinth - Let it be' we would automatically generate the slug 'labrinth-let-it-be' but if you wanted you could make that 'music-promos/labrinth-let-it-be' it gives it a bit more context, but it is completely up to you what you think it best. When editing the slug make sure there are no spaces or illegal characters that cannot be in a URL. You can edit the slug anytime, but remember if you have any links elsewhere to that item you'll loose the link, in which case you would have to add in a redirect or go edit that link. We have covered how to use Fabrik to give you the best chance of a decent SEO rank, but it doesn't stop there - you can help further by getting inbound links to your site. Basically the more popular your site, the more Google or any other search engine will pay attention to it. Obviously the easiest starting place is social networks. Add your website to all the social networks you use and share out your new website address, this will potentially drive people to your website and also give you some inbound links for search engines to crawl. The more places you can get links to your website the better but always remember the more authoritative and popular the website linking to yours the better. Something like Huffington Post will give you a much greater score than your friends blog, unless your friend has a very popular blog of course. If you can, make sure the linking text to your website is in keeping with what you want to rank for - so don’t link ‘my new website’ - use your name and job title or project title. If you want us to share it for you just send us a message on Facebook or Twitter and we'll happily help you out. That is the very basics of SEO, if you want to know more there are plenty of resources on the internet, or get in contact with us and we can point you in the right direction. Always bear in mind SEO is not a one-time job; it's an ongoing task you have to keep up. If you found this completely useless please let us know, just hit the rating below.